Most Rosh Hashana menus are built around a meat and poultry entrees and often include fish and a chicken-based soup as well, but you don't need meat to enjoy a beautiful, festive meal. This vegetarian menu showcases several foods that hold special meaning on Rosh Hashana; most are vegan, and all of them are pareve (dairy-free), in case you'll be accommodating both omnivores​ and vegetarians, and want the option of adding some non-vegetarian dishes to the lineup. 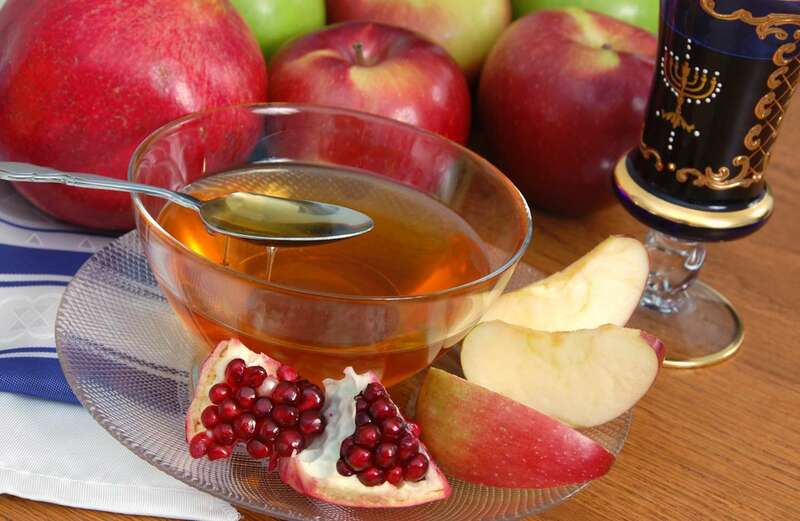 Ashkenazim favor apples dipped in honey to herald a sweet new year. Try a tasting of a variety of apples from the farmer's market along with a selection of artisanal honeys. If you'll have vegans at the table, offer silan, or date honey; The Date Lady offers a nice one. A round raisin challah is a mainstay of many Rosh Hashana meals. This homemade Honey Wheat Raisin Challah is studded with sweet golden raisins and enriched with white whole wheat flour, vanilla, and a touch of cardamom. If you need a vegan alternative, try this Maple-Glazed Vegan Water Challah -- you can leave it plain, or knead raisins into the dough. This vibrant Roasted Carrot, Apple, and Celery Soup makes an elegant starter to a festive meal. If you want a more traditional holiday soup, this Vegetarian Matzo Ball Soup has so much savory flavor, no one will miss the chicken. Colorful and satisfying, this Vegetable and Chickpea Tagine with Couscous is easy to prepare and looks impressive. Broccoli is always a crowd pleaser, and this Roasted Broccoli with Ginger is absolutely irresistible. Don't expect to have leftovers! This healthier spin on a traditional Jewish Apple Cake features whole grain flour and less fat and sugar than the original recipe.